I wish you could see my breakfast right now. It’s so pretty. Alas, the camera is on its way to a machine sale at Lanark in the front of the van right now, so my powers of description should be put to the test (as well as the powers of typing with one hand as breakfast is too good to allow to become congealed). Ripped round lettuce leaves for the base (the only item that isn’t left over). 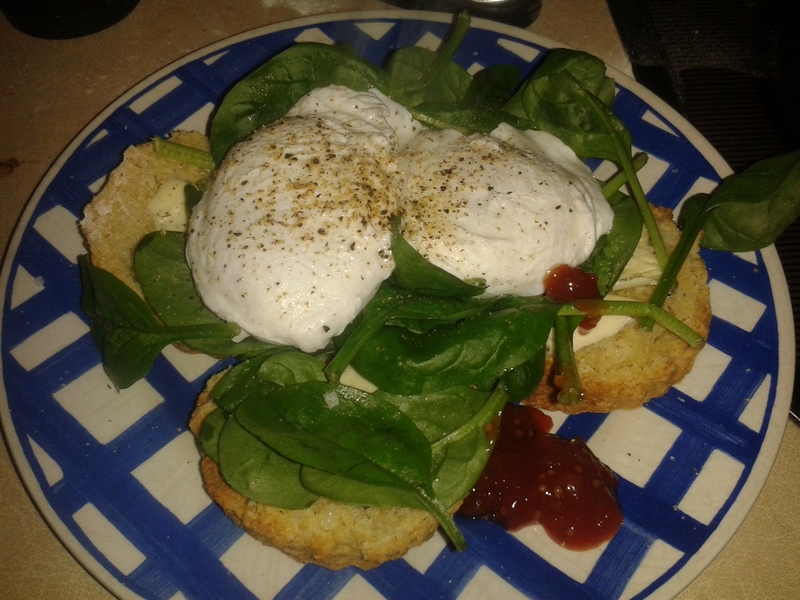 Two thick slices of halloumi, dry fried till rubbery and nutty, topped with a perfect poached egg and a lightly fried, sliced, gutted, half tomato that I didn’t fancy facing in a lunchtime cachumba. Beetroot puree with lime a la Nigella (her book, Kitchen) on the side. Can you see the colours? Brown and green with pale yellow and white, sunshine yolk and soft red, finished with magenta. Nothing wasted. Halloumi and beetroot because Himself fancied me rustling up a starter one night; garlic butter because it is fabulous (if you buy a garlic baguette, how can you have left over butter? ); one of the remaining eggs in the two trays Himself picked up for £3 on Christmas Eve and the tomato. Hedonist puritanism at its best. Nothing wasted, but destined instead to become a soul-feeding joy; a reward for being dragged out of bed at 5.35am on a school day. Granola, ola, ola ola oh! Whoodoopidoopidooby whoopdoobydoobydooby… YEAH! 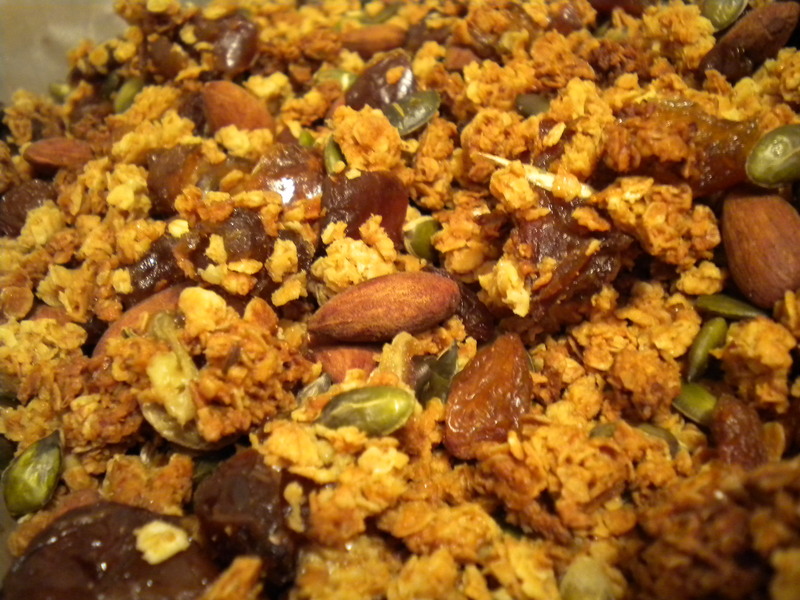 Using the quantities in the Amateur Gourmet’s blog with my ingredients I can present to you: Magpie’s genius granola. Damn it’s good. It’s like risotto. You make the basic staple first and then add the flavours to it in any combination that works. Recipes like that are incredibly freeing. Toss these dry ingredients together like a salad. Note: I wouldn’t put as much salt in as that. I did and I could taste salt sometimes. Mix these together and pour onto the dry ingredients. With hands alone, squeeze the nectar into the oats, making fists in the mixture until the syrup is even throughout. The oats should be lightly coated with a thin sheen of sweetness. Now you have the base. Preheat the oven to 160 C or 325 F and prepare 6 tbsps each of four different nuts, seed and dried fruit. This particular genius combination was chopped dates, whole almonds, pumpkin seeds and sultanas. Spread the oat mixture chunkily across a baking tray. It’s best not to put too much on one tray because it doesn’t crisp up so well. Put into the oven for 10 mins. Take out, turn over the pieces and sprinkle the 6 tbsp almonds across the surface. Back into the oven for 10 mins. Take out, turn over the pieces and sprinkle the pumpkin seeds over. Back into the oven for 5 mins. When the oat rubble is golden brown and becomes crunchy when cool, remove from the oven and sprinkle over the chopped dates and sultanas. Mix it all up, cool thoroughly, and store in an airtight jar. There are, of course, a variety of routes that granola can take to your belly.